The “party kitchen!” This charming shop in Fiesta de Reyes offers traditional and festive products and supplies sure to brighten up any kitchen. Here you will find tablecloths, hand-painted art fruit bowls, Talavera plateware, Mexican glassware, festive rugs, Mexican vanilla, spices, herbs, Mexican chocolates, hand-painted glass window decorations, a variety of cookbooks, and so much more. 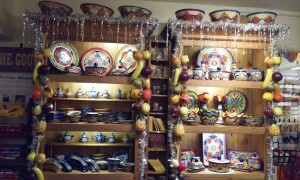 The kitchen is the heart of any home and Fiesta Cocina will make yours sing with the joyful party spirit.